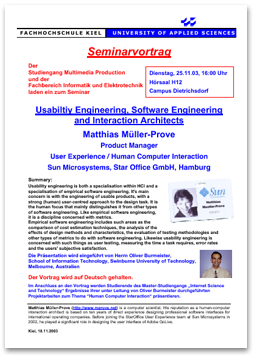 Usability engineering is both a specialisation within HCI and a specialisation of empirical software engineering. It's main concern is with the engineering of usable products, with a strong (human) user-centred approach to the design task. It is the human focus that mainly distinguishes it from other types of software engineering. Like empirical software engineering, it is a discipline concerned with metrics. Empirical software engineering includes such areas as the comparison of cost estimation techniques, the analysis of the effects of design methods and characteristics, the evaluation of testing methodologies and other types of metrics to do with software engineering. Likewise usability engineering is concerned with such things as user testing, measuring the time a task requires, error rates and the users' subjective satisfaction. Die Präsentation wird eingeführt von Herrn Oliver Burmeister, School of Information Technology, Swinburne University of Technology, Melbourne, Australien; er ist zudem Director of the Australian Institute of Computer Ethics.